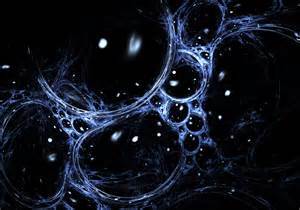 Dark-Energy / Dark-Matter: A Riddle, Wrapped In A Mystery, Inside An Enigma: Has Science Finally Stumbled Upon The Spiritual Dimension ~ Metaphysical Superspace ~ The Numinous? ​We are entering the Age of Aquarius ~ the astral realm of the fifth-dimension. Its an exotic, hyper-evolved, alien reality ~ a transcendent plane of awareness and existence ~ an alternative spiritual hyperspace reality; It is the universal superconscious ethernet ~ the omniscient integrative matrix interconnecting all things. It is the divine hyperdynamic unity-field ~ where fifth-dimensional, extraterrestrial, hyperintelligent, celestial beings of light are the supernatural denizens of an ethereal, metaphysical, subatomic, superspace reality. This is the primordial living energy connexus ~ a purely protean, hyperdimensional, synchronet matrix of transcendent consciousness and interconnectivity ~ the foundational First Cause ~ continually undergirding the entire existence. ​​This emerging era of an Alternative Fifth-Dimensional Hyperspace Reality will call attention to a much-overlooked element. Whereas the four traditional elements: earth, air, fire, and water have dominated various epochs in the past, there will be a fifth element to reckon with in the time of the Fifth Sun: Ether. The dictionary defines Ether as the rarefied element of the Heavens. Ether is a medium. 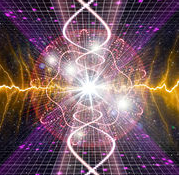 It permeates all space and transmits waves of energy in a wide range of frequencies ~ from the higher vibrational resonance of human auras ~ to Christ-Consciousness ~ to thought processing at the subatomic / electron level. We Have Absolutely No Idea What This Is, Beyond The Fact That It Makes Up 96% of Our Universe." ​It is a profound mystery: known to scientists and academicians ~ in a dry, intellectual, hypothetical way ~ as "dark-energy" . . . but to transdimensional travelers, seekers of existential truth, and the neoshamanic counter-culture, it is known directly: through immersive experiences ~ through ecstatic states of transcendent awareness ~ through the disruption and realignment of one's reality-paradigm ~ through immediate, interactive, close-encounters with the interdimensional / extraterrestrial / UFO / hyperspace phenomenon itself. ​​The latest esoteric mathematical calculations have clearly indicated the existence of two relative new inexplicable and elusive hypothetical substances Dark energy and dark matter account for most of the universe. Dark-matter accounts for 23.3 percent of the cosmos and dark energy fills in 72.1 percent. Together, these materials make up a whopping 95.4 percent of the universe.... But aside from the fact that nearly all competent scientists believe in the theoretical existence of dark energy and dark matter.... science has absolutely nothing else to say about them. What is ethereal is related to the domains beyond Earth: heaven, higher celestial planes. Ether, the element of the Fifth Sun, is transcendental and lacking in material substance, but is no less real than wood, stone or flesh. Within the context of Ether there can be an interfusion of polarities. No more darkness or light in people, but an uplifted fusion. "Ether," naturally, is invisible and undetectable... to both our physical senses, as well as the latest scientific instrumentation. ​​​According to ancient luminous mystigogues of a higher celestial order, the physical plane was created as a refinery for the human mind / heart / soul / spirit interface ~ capable of stimulating and radically accelerating metamorphic spiritual processes ~ esoteric mystical visions, knowledge, and perceptions ~ the illumination of intelligence ~ the development of human consciousness. ​​​The human species finds itself living at the third density level: a plane of dualities and dichotomies ~ a domain of both dark, material-oriented, corrupted power, as well as, subtle ethereal energies and spiritual processes.... 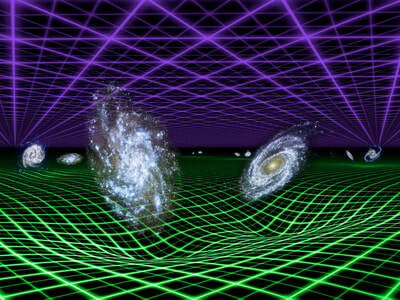 It is a fusion anomaly of three-dimensional and fifth-dimensional realities ~ atomic and subatomic fields. We can reliably educe only this much: 95% of our universe is permeated with these dark elements and they can be explicated In the following way: dark energy is an unknown form of energy, which is hypothesized to permeate all of space; dark matter is an unidentified type of matter distinct from dark energy, baryonic matter, and neutrinos. Although dark matter has not been directly observed, its existence and properties are inferred from its influence on the universe's large scale structures ~ on galaxies, and its effects in the cosmic microwave background. This is essentially all science is able to definitively deduce. Because these subatomic elements remain deeply enigmatic ~ impervious to examination, investigation, or direct experience ~ it is impossible to perform meaningful testing or analysis with the primitive scientific instruments that are currently available. Dark energy and dark matter are both invisible and undetectable ~ to physical human senses as well as to the latest state-of-the-art scientific gadgetry. ​​This has caused much confusion regarding their existence... Yet the answer has always been right in front of them. As the traditional, "buttoned-down," orthodox, scientific community comes to a deeper, clearer understanding of "dark-energy" and "dark-matter," many pieces of the interdimensional extraterrestrial puzzle will begin to fall into place. The resolution to the ancient mystery ~ to alternative hyperspace realities and supernatural celestial beings will begin unfolding before their eyes. ​​Would it really so inconceivable, so anomalistic, to discover the existence of an alternative, synchronous, celestial hyperdimensionality inhabited by luminous transdimensional ethereal lifeforms?... by powerful extra-dimensional celestial deities of pure living light ~ denizens of hyperspace reality ~ who operate at ultra-advanced technological levels ~ effortlessly transcending the established parameters of conventional physics by millions of years? Through exotic hyperdynamic alien physics ~ far beyond the limited cognitive processes of human understanding ~ far beyond what is perceived through the distorting, attenuating lens of the ego-mind ~ they are able to extrude shape-shifting spaceships, glorified bodies, and ecstatic, superconscious, hyperphysical, nirvanic environments for themselves, using enigmatic, subatomic, ethereal energies and God particles. Through meditation techniques they have been perfecting for millions of years these avatars of higher Stellar Orders teach us how to enter an ocean of ecstatic, unbounded awareness ~ an infinite spiritual field of pure and total intelligence, consciousness, beingness ~ beyond thought, beyond emotion, beyond the limiting confines of this three-dimensional physical plane. Of course the significance of all this is obvious: if we strictly adhere to accepted scientific definitions of all three of these hypothetical elements, found in any number of dictionaries, scientific journals, and encyclopedic references, it becomes readily apparent: the scientific encyclopedic descriptions of both Ether and dark-energy are so similar to one another they are virtually interchangeable... In fact, when scientists discovered the existence of dark-energy they may just as well have called it "Ether"... except for the inconvenient truth that mystics had already discovered it thousands of years ago.... In the final equation, of this untenable scenario, the scientists could only confess they had stumbled across something that shamans and mystics of ancient times already had known about, named, and gathered an impressive amount of information on. This would have left the orthodox scientific community in the awkward position of having to admit they had discovered something that had previously been discovered, named, and mapped long ago by interdimensional spiritual explorers. Hold on just a minute: isn't this essentially analogous with the dictionary definition for the ostensibly nonexistent, hypothetical element referred to as "Ether," which has, ever since Nietzsche declared "God is dead," in 1862, been unfairly discriminated against?... and then was reinforced ~ elevated ~ to an even more excruciating degree, as the ideologies of agnosticism and atheism ~ fueled by the savage Darwinian "winner-take-all sweepstakes" of implied anti-spiritual precepts, inherent throughout Darwin's theory of evolution, which promoted a "survival of the fittest mentality" ~ started to become popularized? The famous Scopes Trial of 1925 delivered a devastating blow to the prevailing religious and spiritual doctrines of the day when it was effectively argued in court that the human race, in the final equation, ultimately evolved from a single-celled organism.... which lived roughly 3.5 billion years ago. ​The irrepressible force of conventional science infused with the cultural momentum of anti-spiritual perspectives becoming widely prevalent meant a paradigm-shift was inevitable. Antiquated spiritual doctrines and beliefs from the distant past ~ concerning mysterious, undetectable, transcendental, metaphysical ethereal realms ~ are now ~ in the unassailable age of modern science ~ considered to be completely ridiculous, outdated, mythical notions. The scientific community is fortunate that they have not yet invented instruments able to detect what is happening within the domain of their "dark energy matrix".... because they would then have to capitulate that the immediate observable, empirical evidence, regarding an all-permeating, transcendental, ethereal energy matrix, indicates that paraphysical hyperdimensional realities ACTUALLY DO EXIST. ​The prevailing scientific institutions of the world would never allow themselves to be maneuvered into a situation in which they would be compelled to concede the existence of such a paralogical, counterintuitive phenomenon.... After all the years of haughtiness, sarcasm, and abusive jokes about crazy, metaphysical, spiritual ideas concerning higher celestial planes, this could be problematic to say the very least. Their massive egos would never allow them to admit that all they managed to actually accomplished was to mathematically prove the existence of a subatomic hyperdimensional spiritual reality that had already been discovered, explored, named, and mapped long ago by interdimensional hyperspace explorers.